Make your fireplace a diamond in the rough with this sparkling jewel of contemporary flair. The Real Fyre 10 Pound Package of Fyre Gems Media sparkles as it draws the eye of all that see it in action. 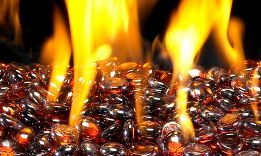 Designed to be long lasting with Real Fyre glass media burners, this is a dazzling way to increase the contemporary appearance of your hearth. This kit consists of fire glass only. All additional components needed for a functional fire glass set must be purchased separately. Shine brighter than any gem with this media kit from Real Fyre.